Citation: 2018 Danjo S, et al. This is an open-access article distributed under the terms of the Creative Commons Attribution License, which permits unrestricted use, distribution, and reproduction in any medium, provided the original author and source are credited. As average life expectancy has increased, so has the prevalence of meningioma among the elderly. However, surgical treatment may not be feasible in this group because older patients often present with comorbid illnesses, such as cardiac disease. In addition, meningioma can cause various neurological and psychiatric symptoms, which vary depending on the site of the lesion. One such phenomenon is Charles Bonnet syndrome (CBS), which is characterized by visual hallucinations  due to visual impairment caused by lesions of the peripheral and central nervous systems, and ophthalmological disorders. Although psychotropic medications have been used to treat CBS, there is no established treatment for this condition. Because CBS is frequently observed in the elderly, it is important to use drugs with the fewest possible adverse reactions. Kampo is a treatment option with proven safety and effectiveness for certain diseases. Yi-gan san (YGS) is effective for the treatment of various psychiatric manifestations and has a well-established tolerability . We report the successful treatment of visual hallucinations and irritability caused by meningioma using YGS in a patient contraindicated for surgery. An 83-year-old man presented with a 3-month history of intermittent visual hallucinations and irritability. For example, he reported seeing a few children in his room and a whitish ghost. A detailed history revealed that slow progressive vision impairment had started when he was 81 years old. He presented to the Department of Neurosurgery and was diagnosed with reduced vision (right vision=0.01, left vision=0.15), but no neurologic findings were detected. Magnetic resonance imaging (MRI) supported a diagnosis of a meningioma of the olfactory groove that was compressing the atrophic optic nerves. Surgery was contraindicated because he had a history of comorbid atrial fibrillation and his vision was not expected to improve. Over the next 2 years, there was no significant increase in the size of the meningioma and no symptoms of intracranial hypertension had developed. On examination, he was fully awake and cooperative, but raised his voice to his family members over very minor irritations. He had only light perception and could see faint silhouettes of people. All other neurological examinations were unremarkable and there was no evidence of Parkinsonism. An assessment of his cognitive function revealed moderately impaired orientation and attention, but intact memory. MRI (Figure 1) revealed a giant olfactory groove meningioma in the medial frontal region of the brain and edema around the tumor had increased in comparison with the last examination. 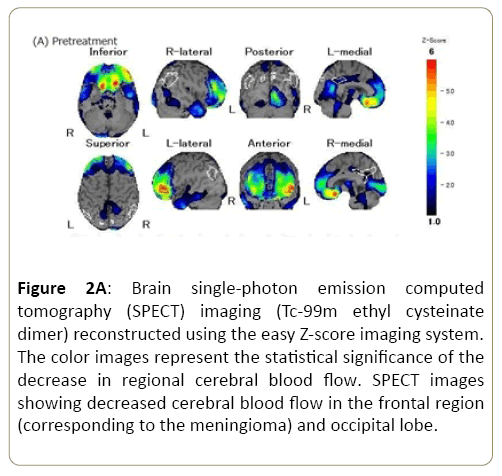 Original single-photon emission computed tomography (SPECT; Figure 2A) showed decreased cerebral blood flow in the frontal region, corresponding to the meningioma, and in the occipital lobe. Figure 1: T2-weighted magnetic resonance image (sagittal section) showing a giant olfactory groove meningioma measuring 45 mm × 59 mm (*), which was adjacent to the cerebral falx and anterior cranial base in the medial frontal region of the brain. Figure 2A: Brain single-photon emission computed tomography (SPECT) imaging (Tc-99m ethyl cysteinate dimer) reconstructed using the easy Z-score imaging system. The color images represent the statistical significance of the decrease in regional cerebral blood flow. SPECT images showing decreased cerebral blood flow in the frontal region (corresponding to the meningioma) and occipital lobe. Since surgical intervention was considered inappropriate, treatment with 7.5 g/day of YGS was started. He experienced no visual hallucinations from the treatment the next day and the symptom of irritability had improved within 2 weeks of the start of treatment. Furthermore, the Neuropsychiatric Inventory score improved from 15 before treatment to 6 at one month after starting treatment. SPECT performed at 6 months after treatment showed that the decreased cerebral blood flow in the occipital lobe had improved (Figure 2B). The patient reported no adverse events to YGS therapy. 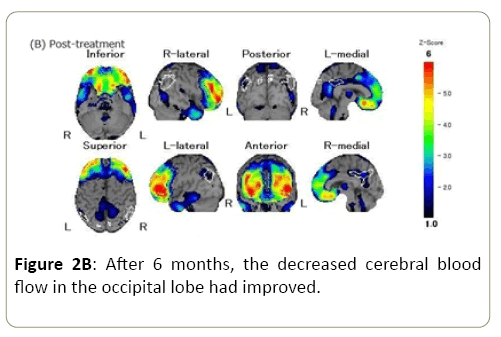 Figure 2B: After 6 months, the decreased cerebral blood flow in the occipital lobe had improved. We experienced a case of visual hallucinations that was successfully treated with YGS. Elimination of the underlying cause is the most effective treatment for visual hallucinations associated with ocular disorders or central optic pathway lesions in CBS patients. Although this patient had a meningioma, his age and comorbid cardiac disease precluded surgery. Indeed, the few case reports on CBS in meningioma patients [3,4] describe the resolution of visual hallucinations after surgical resection. To the best of our knowledge, this is the first report of visual hallucinations successfully treated without surgery. Traditionally, when surgery is not possible, antipsychotic or antiepileptic drugs are used for treatment of CBS. However, the use of antipsychotics increases the risks of fracture and aspiration pneumonia in the elderly [5-7]. Conversely, YGS is relatively safe and has equal effectiveness for improving psychiatric symptoms, such as hallucinations and delusions, in dementia patients . YGS is not a simple preparation, but rather a crude drug mixture. An important component of YGS is Angelicae radix, which is known to affect gamma-aminobutyric acid and serotonin (5-HT) receptors. In particular, 5-HT2A receptors are widely expressed throughout the central nervous system and are involved in neuronal excitation . The 5-HT2A antagonism by YGS may contribute to antipsychotic action. Although the underlying mechanism of CBS is not fully understood, it is generally believed that loss of visual input (for whatever reason) causes disinhibition of the visual cortex, which in turn leads to visual hallucinations . In this case, we believe that down-regulation of 5-HT2A receptors by YGS may have inhibited visual cortex activation, resulting in the disappearance of visual hallucinations. The improvement in visual function was supported by SPECT images, which showed increased cerebral blood flow in the primary visual area. Although a report has described improvement of cerebral blood flow after treatment with YGS in a Lewy body dementia patient, there have been few investigations of the effects of YGS for treatment of other disease . Therefore, the mechanism underlying the effects of YGS remains unknown. Our results suggest that YGS was safe and effective for the treatment of visual hallucinations caused by a giant olfactory groove meningioma. This case suggests that treatment with YGS may ameliorate visual hallucinations and improve the quality of life of affected elderly patients. This work was partly supported by the Grants-in-Aid for Scientific Research, the Japan Society for the Promotion of Science (No. 17K17925). Teunisse RJ, Cruysberg JR, Hoefnagels WH (1996) Visual Hallucinations in Psychologically Normal People: Charles Bonnet's Syndrome. Lancet 23: 794-797. Miyaoka T, Horiguchi J (2009) Clinical Potential of Yi-Gan San (Yokukansan) For Psychiatric Disorders. Curr Psychiatry Rev 25: 271-275. McNamara ME, Heros RC, Boller F (1982) Visual Hallucinations in Blindness: The Charles Bonnet Syndrome. Int J Neurosci 17: 13-15. Gupta R, Singhal A, Goel D (2008) Charles Bonnet Syndrome: Two Case Reports. J Neuropsychiatry Clin Neurosci 20: 377-378. Rigler SK, Shireman TI, Cook-Wiens GJ (2013) Fracture Risk in Nursing Home Residents Initiating Antipsychotic Medications. J Am Geriatr Soc 61: 715-722. Echt MA, Samelson EJ, Hannan MT (2013) Psychotropic Drug Initiation or Increased Dosage and The Acute Risk of Falls: A Prospective Cohort Study of Nursing Home Residents. BMC Geriatr 13: 19. Van der Maarel-Wierink CD , Vanobbergen JN, Bronkhorst EM (2011) Risk Factors for Aspiration Pneumonia in Frail Older People: A Systematic Literature Review. J Am Med Dir Assoc 12: 344-354. Teranishi M, Kurita M, Nishino S (2013) Efficacy and Tolerability of Risperidone, Yokukansan, and Fluvoxamine for the Treatment of Behavioral and Psychological Symptoms of Dementia: A Blinded, Randomized Trial. J Clin Psychopharmacol 33: 600-607. Liao JF, Jan YM, Huang SY (1995) Evaluation with Receptor Binding Assay on the Water Extracts of Ten Cns-Active Chinese Herbal Drugs. ProcNatlSciCouncRepub China B 19: 151-158. Kazui H, Ishii R, Yoshida T (2009) Neuroimaging Studies in Patients With Charles Bonnet Syndrome. Psychogeriatrics 9: 77-84. Mori T, Ikeda M, Fukuhara R (2006) Correlation of Visual Hallucinations with Occipital Rcbf Changes By Donepezil In Dlb. Neurology 66: 935-937.